The “Hastert Rule” has received some attention in the press lately, as some House conservatives have demanded that Speaker Boehner not bring up any immigration bill that does not pass this test. The unwritten Hastert Rule states that the Speaker will only bring a bill to the floor “if the majority of the majority” supports it. The Hastert Rule makes a lot of sense, from a certain perspective. The Speaker of the House directs the flow of debate for the body, but unlike his counterpart in the British House of Commons, he is not an impartial umpire. Though he leads the whole House, he is still a partisan actor elected by the majority party. He has his own agenda and to carry out his plans, he must maintain his party’s support. Thus, the Hastert Rule is a good rule of thumb for him to follow to keep his supporters happy. The Speaker can easily carry out his party’s demands because the House is based on the majoritarian principle – that is, the House Rules are specifically designed to allow a determined majority to achieve its policy objectives. The history of the House of Representatives is one of steadily increasing power for the majority at the expense of the minority. Walter Oleszek, with the Congressional Research Service writes, “The principle of majority rule is embedded in the rules, precedents, and practices of the House.” As a result, the House is structured to enact the will of the majority party, and victories by the minority are supposed to be, by design, extremely rare. Over the past few decades, minority victories have been very rare indeed. Since the 1970s, when power shifted from committees to the party leadership, the House has operated under what political scientists call Conditional Party Government. This was a term developed by political scientist David W. Rohde, currently of Duke University. Rohde argued that the reforms of the 1970s increased the power of party leadership and created a situation where Members of the majority party believe their political opportunities are enhanced by supporting the position of the party leadership. In turn, the leaders will not propose a bill unless a consensus exists within the party. In effect, Members willingly cede their own independence to their party leaders, in exchange for the promise of political help and protection in the next election. The idea is that a party that can successfully enact its agenda will be better able to raise money and get its members reelected. The leaders then use their absolute control of the procedural apparatus of the House to enforce their will on the House floor. Speaker Dennis Hastert succinctly summed up Conditional Party Government when discussing why he did not allow the Democrats to participate in drafting the 2003 Medicare prescription drug. 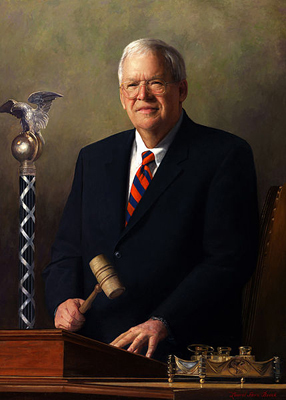 In formulating what is now known as the Hastert Rule, he said such bills would reach the House floor only if “the majority of the majority” supports them. That is the essence of Conditional Party Government. And not coincidentally, that legislation that had passed by a wide bipartisan majority in the Senate, barely passed the House, and only because one Member changed his vote under pressure, during a roll call vote that was held open for an unprecedented and bitterly disputed three hours. But all this talk of Conditional Party Government raises a question: Just what constitutes a majority? Historically, it has not always been so partisan. Conditional Party Government, which produces the Hastert Rule, conflicts with the traditional way of understanding American representation. The real majority is not always a partisan one. A majority can mean any 218 votes on any amendment or bill voted on by the House, which means there is the possibility of changing majority coalitions on any number of different issues. Agricultural interests might band together against urban interests. States that do not receive an equitable share of highway dollars relative to the taxes paid by their constituents (donor states) might band against states that receive more funding than their taxpayers paid for. In the past, these various coalitions could, and often did, crisscross the aisle – and they changed from vote to vote depending on the interests of a Member’s constituency. In a democratic republic, legislators are elected by individual constituencies, and their primary loyalty, in theory, should be to the interests of their constituents. A Republican from a rural district in the South will not always agree with a Republican Representative from an urban manufacturing district, so they should not always vote the same way simply because they are Republicans. By contrast, members of a parliament serve at the pleasure of their party, and if the majority party falls, new elections are called. Under Conditional Party Government in the United States, the House has been functioning more like a parliament than a congress whose members are elected independently. This is not what the authors of the Constitution anticipated. It is true that they believed the House should act on the will of the majority of voters – after all the House was, at the time, the only body elected directly by the people. (The Senate would, in the words of George Washington, cool the “hot passions of the House.”) Indeed, when the Constitution was ratified, there were no political parties in the United States. There were regional interests, differences of opinion over how large the Federal Government should be, and differing philosophies of governance, but Congress was not established as a partisan-dominated institution. Today, it is fair to argue that Congress has evolved such that the parties control practically every aspect of it. We are left with a more partisan and polarized House, where Members increasingly rely on party leadership for legislative accomplishments, position and power. The fact that Congress is party controlled has a direct effect on the kind of legislation produced. Remember that a bill is brought to the Floor if a consensus of the majority supports it. This could mean that only a simple majority of the majority supports it, in which case, nearly half of the votes for the bill would have to come from the minority. (This is exactly what happened in January on the legislation that made most of the Bush tax cuts permanent, but increased rates for those earning over $400,000.) The reality is that most of the time the party leadership must secure the support of a supermajority of the majority. This has a polarizing effect on legislation. So under the regime of Conditional Party Government, in the House, the working majority therefore is not 218 votes, but rather the median vote in the majority party. Follow this closely. In the 111th Congress, the Democrats had 256 votes and the Republicans had 178 votes. Under the theory of Conditional Party Government, the majority of the majority was 128 votes – half of the 256 Democrats. If you put the House of Representatives on an ideological scale where the most liberal Member’s ideology was represented by 0 percent and the most conservative Member was represented by 100 percent, the 128th vote, or the “majority median vote” was 29 percent. That means, in theory, the 128th most liberal Member of the House would determine what comes to the Floor of the House. As a result, the position of the party leadership was significantly more liberal than the midpoint of the entire House. In the 2010 mid-term elections, Republicans gained a majority of 243 Members. Under Conditional Party Government in the 112th Congress, the majority of the majority would be 121, which would be 72 percent on the ideological scale. That means the 121st most conservative Member would be the median for determining what the House will vote on. Consequently, the position of the party leadership would be significantly more conservative than the midpoint of the House (218). The present majority of the House in the 113th Congress is 234, making the median Member of the majority the 117th most conservative Representative. Now an observer of the American political system can begin to understand why the Democrat majorities in Congress appear more liberal than the population at large, and the Republican majorities appear more conservative than the American electorate. Conditional Party Government is by its nature more polarizing because it pulls both parties towards their ideological extremes. And to be clear, both parties have adopted it when they are in control. This is why the then-Speaker Pelosi’s version of Obamacare was substantially to the left of a good many of her own party members, but did not go as far as many of her left-wing colleagues wanted it to go. It was as far left, in the judgment of Nancy Pelosi, as she could go without having a majority of her own party against it (and she needed a supermajority of her Members to support it, since a bill her Caucus would have supported would not attract Republican votes). The anecdotal evidence to support this is that party liberals felt the bill did not go far enough, while many Blue Dog Democrats felt the bill was too liberal. Many constituents of the Blue Dog Democrats also thought that the healthcare reform act was too liberal and voted for Republicans in the next election, which shows the risks of Conditional Party Government. And this is why it will be difficult for Speaker Boehner to pass an immigration bill under the Hastert Rule – opponents of immigration reform only need to keep 117 Members in opposition and legislation will never get to the House floor – even though a bipartisan coalition of Democrats and Republicans might be able to forge a compromise that could pass the entire House. In practice, to enforce the will of the majority party conference, the Speaker uses the Rules Committee to manipulate the Floor procedures of the House to specifically block bipartisan compromises that might challenge the majority position. “The rules of the game are easy enough to manipulate by a majority party to foreclose opportunities to vote on alternatives that would attract bipartisanship,” said Sarah Binder, senior fellow at the Brookings Institution. There are some caveats and complications if the House majority wants to use these strong-arm tactics and steamroll the minority. First of all, it requires a relatively cohesive majority. In other words, if the minority party is not allowed to participate in shaping legislation, leadership has to make sure it can still get 218 Members of its own party to support the legislation on the floor. This can empower a small minority of the majority party to be able to blackmail their colleagues with the threat to vote against the majority’s agenda. In the current Congress of 234 Republicans, just 17 Republicans can threaten to vote against legislation and prevent the Speaker from passing the bill, if he would like to do so without Democratic help. The splinter group forms a de facto alliance with the minority party to put pressure on the Speaker – and today, the minority party is always happy to collude with their ideological opposites, because in politics, “the enemy of my enemy is my friend.” Another irony of Conditional Party Government is that while it is meant to encourage a unified majority, it almost always guarantees an angry and unified minority. In the past, under such a threat of legislative blackmail, the Speaker would have moderated the bill sufficiently to gain enough votes from the minority party to pass the legislation – making the final bill even less attractive to the renegades. For instance, when the Civil Rights bill was being considered in 1964, the Democrat Speaker faced massive opposition from southern Democrats in his own party. So, President Johnson appealed for Republican support, and 80 percent of the House Republicans rallied to the Democrat president and passed the Civil Rights Act. The final vote had 152 Democrats for and 96 against – well short of a majority of the whole House – but 138 Republicans vote for it and only 34 against, allowing for a comfortable bipartisan majority of 290-130. Conditional Party Government produces very different vote tallies because it essentially excludes the minority party from participating in shaping legislation. Speaker Pelosi passed Obamacare without a single Republican vote. The Civil Rights bill passed with bipartisan majorities and became the undisputed consensus of the American public that has never been challenged. Obamacare, on the other hand, continues to face widespread opposition with the public and in Congress – making its future enactment precarious three years after it passed. Additionally, it is worth noting that the Civil Rights Act did satisfy the Hastert Rule, which does go to show that the Rule is not intrinsically bad. But when the majority party expects a kind of “Super Hastert Rule” where it passes legislation on the strength of the majority party alone, then bipartisan action is excluded. A simple majority, culled only from the majority party, might be fair and legal, but it is a poor way to govern. Some issues are too important to go through with only a simple majority; a bipartisan process is more likely to reflect national consensus and create good law. Today, the great irony is that the small band of Republican renegades in Congress only want to follow the Hastert Rule and demand strict party loyalty when they agree with the majority of the Conference. They have no difficulty in splintering off on votes when they oppose the majority of their colleagues. In the end, this will either be their undoing, or the undoing of the Republican colleagues. Either the public will grow tired of an ineffective majority and vote them all out of the majority, or their fellow Republicans will grow tired of being held hostage to the most ideologically extreme of their colleagues and will begin to offer opportunities for more like minded Democrats to participate in crafting legislation. That is, if there are enough moderate Democrats left to form a working majority coalition with – but that is a post for another day.